Are you constantly covering your mouth when you laugh because you’re worried about tooth stains? Perhaps you’ve noticed that your teeth aren’t as white and bright as they used to be. Many people feel anxiety about the brilliance of their smile. Over time, trauma, aging, and certain foods and drinks can reduce the brightness of your teeth. The good news – you don’t have to live with stained teeth. Several types of tooth whitening are available to help you get that bright, beautiful smile you want, and you won’t have to hide your smile anymore. Why do teeth lose their brightness over time? While your teeth appear to be smooth, they actually have tiny pores. These pores may become rough so they lose their sheen or they can pick up stains that make teeth look dull or stained. Even if your teeth are stained, you do have whitening options. Every option comes with its own pros and cons, so you’ll need to learn more to determine which whitening solution will work best for your needs. 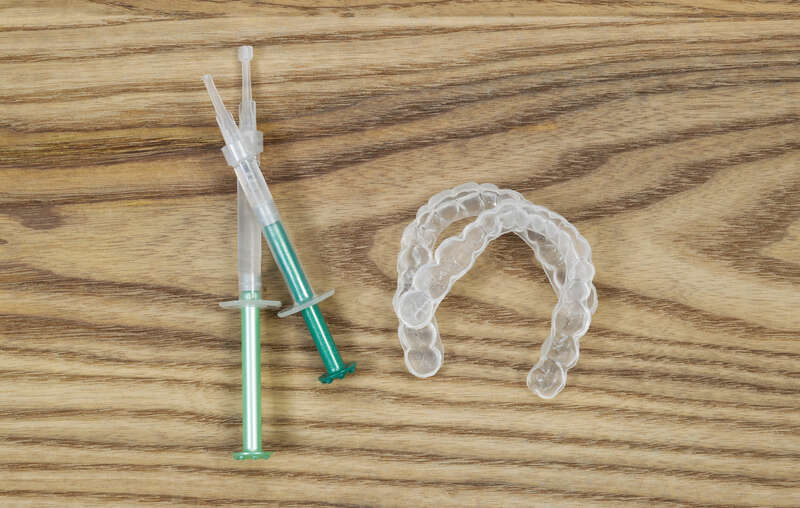 Tooth whitening products are available over-the-counter, and these products include bleaching gels, bleaching trays, whitening strips, and whitening pens. Over-the-counter options are inexpensive, but remember, they’re also the weakest whitening treatment and they’re not designed to meet your specific whitening needs. A few of the benefits of over-the-counter options include convenience, low cost, and the ability to do-it-yourself. However, drugstore products just aren’t as effective as other types of whitening, and the results don’t last as long. Incorrect application of bleaching agents can even lead to burns on your gums or tooth sensitivity. For more difficult stains, these products may not provide the results you want. Another option is take-home dental trays provided to you by your dentist. While these treatments still allow you to do it on your own and in your own time, they’re stronger than over-the-counter whitening options and are designed specifically for your whitening needs. Your dentist can even offer you whitening trays that include a fluoride additive that can help protect your teeth against cavities – an added bonus. However, take-home options still aren’t as strong as in-office procedures, they can take as long as 20 days to complete the treatment, and you have to apply carefully to ensure you get even whitening results. For most people, the tooth whitening option that works best and offers the most significant results is in-office tooth whitening. In just a short time a dentist can determine the right product for your teeth, clean the surfaces of teeth, and then apply a whitening agent. This will be done evenly and thoroughly, and depending on the specific procedure, it may only take an hour or two. One of the main benefits of in-office whitening is how long it lasts. Your results can last for a year or more. Most patients also find that they get the best results from in-office whitening since professional whitening can offer multiple shades of whitening with a single treatment. Of course, whitening procedures may not be covered by your dental insurance, so you may have to pay out of pocket if you want in-office whitening. Some people also notice that they have temporary gum or tooth sensitivity after in-office whitening. If you invest in in-office tooth whitening, you’ll want to take measures to keep them looking bright after treatment. Even after professional whitening, it’s still possible for teeth to get stained. If you’re a smoker, kick this habit to prevent more stains. You’ll also want to think twice before sipping on staining drinks like red wine, tea, or coffee. To lower the chances of stains, drink these beverages with a straw and rinse your mouth out with water when you’re done. If you need help determining which whitening treatment is right for your needs and if you’re a good candidate for in-office treatments, talk to your dentist. Your dentist can discuss your whitening goals, dental history, and budget with you to customize a treatment plan that gives you the beautiful smile you want.